"Prairie Pawn” tells the story of Paul Torridon, called White Thunder by the Cheyenne Indians holding him hostage. They believe that he cured Whistling Elk’s son from a menacing illness and brought rain when others had failed to do so. Though Paul has been rewarded with many riches, he still seems unhappy, and the Cheyenne chief decides to undertake a dangerous mission to kidnap Torridon’s sweetheart, Nancy Brett, from Fort Kendry. The Cheyennes believe that will make White Thunder happy enough to voluntarily stay with them. In the title story, "The Steel Box,” Lew Sherry and Pete Lang accept an offer they simply can’t resist. Oliver Wilton is willing to pay the cowboys $1,000 a day for ten days to protect him from danger that has him living in a state of terror. A seafaring man has arrived at the inn in town and has made no secret of the fact that he’s come to settle a score with Wilton. In the meantime, Wilton’s niece, for whom he manages a half-million dollar trust, has been seen target practicing with a gun equipped with a silencer. Oliver Wilton has reason to fear for his life, but can two unwitting cowboys save it? 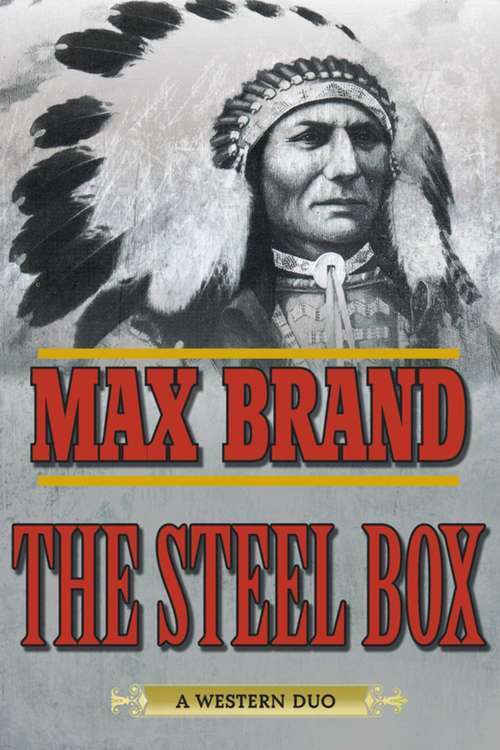 With these two rich and detailed tales, Max Brand shows again why is he is regarded as one of the finest authors ever to work in the Western genre.